Round Up or Round Down? What to do About the 1/2"
This entry was posted on February 28, 2015 by admin. When measuring yourself for a corset, we always recommend that you start with the measure of your natural/relaxed waist and then subtract 4" to 5" to get your size for a steel boned corset, and to subtract 6" to 7" from the measure of your waist to get your size for a waist training corset. But what are you to do if your waist measure so many inches and a half? Should you round up or round down? 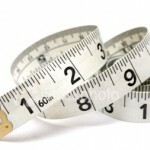 There are those who believe that if your waist measures 30” or more and you have a ½”, to round down and if you have a waist that measures beneath 30” and you’ve got a ½” on there, to round up. What’s most important to take into account here is what your middle feels like. Firm? Little bit of extra fluff or squish? This is what will really help you to determine your ideal size. So keep in mind that if you have a firm middle, you will want to consider rounding that ½” up. And if you have a bit of extra fluff or squish, then go on and round down. And there you have it: how to handle the half inch.